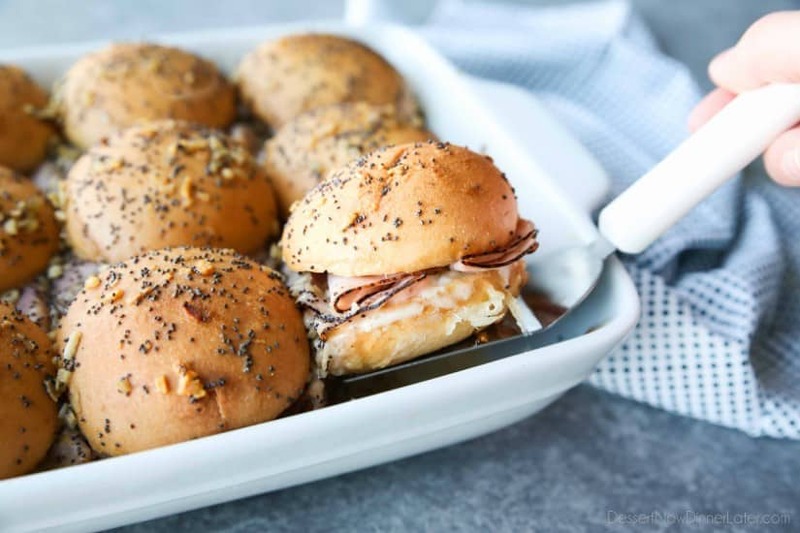 Ham and Cheese Sliders - Dessert Now, Dinner Later! 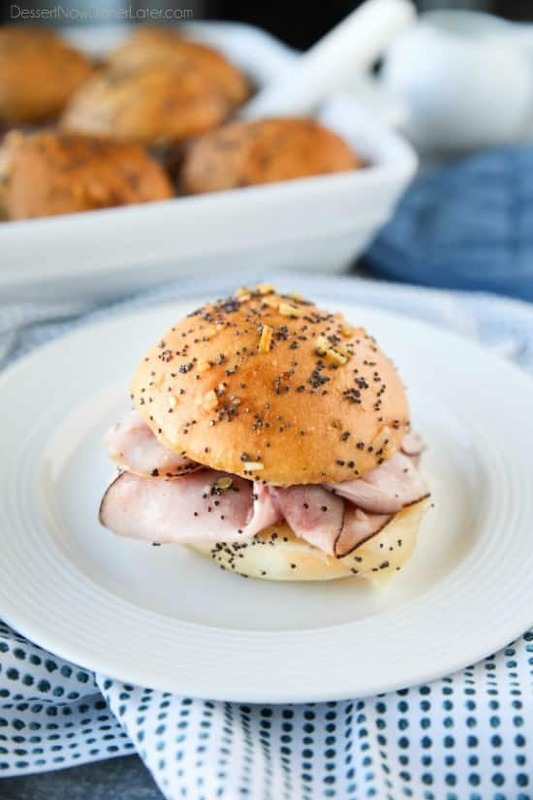 Ham and Cheese Sliders are baked in the oven with a buttery honey-mustard topping. Use leftover Christmas ham, or make them for dinner or game night. They’re fast, easy, and feed a crowd! *This post is brought to you by Rhodes Bake-N-Serv. Thanks for supporting the brands that make Dessert Now Dinner Later possible. The year is coming to a close and this will be my last post until the new year. With potty training a new puppy (we got a mini Australian shepherd) and my toddler all at once (on top of the typical holiday hustle and bustle), I am struggling to find time to create delicious recipes in the kitchen. But let me tell you! 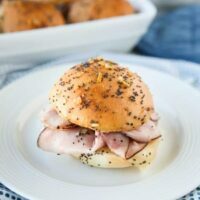 These ham and cheese sliders are SO good and SO easy! My eight year old son immediately declared it a favorite dinner of his. I’m thinking it will go in the regular dinner rotation as well. 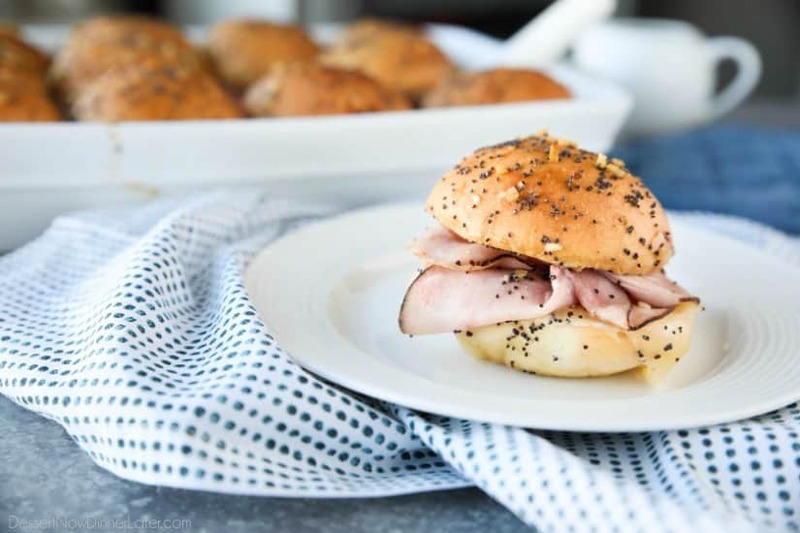 All you need to make these ham and cheese sliders are Rhodes Warm-N-Serv Soft Yeast Rolls, mayo or miracle whip (whichever is your preference), sliced ham and cheese, and a few other ingredients for a honey-dijon butter sauce. 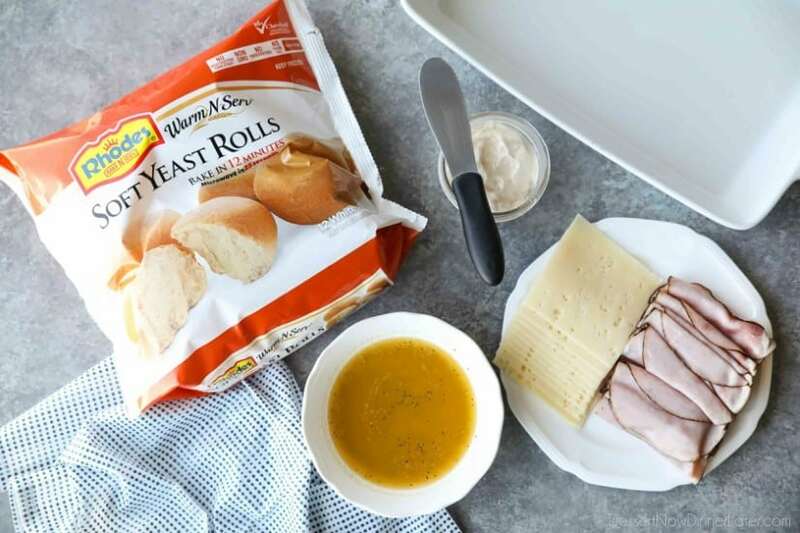 Use a serrated knife to slice the rolls in half. Place the bottom halves in a greased 9×13-inch pan. Spread a layer of mayo on top of the rolls. Then layer one slice of cheese, and a few slices of ham on each roll. Add the top halves of the rolls. Mix up melted butter, honey, dijon mustard, poppy seeds, dried onion, Worcestershire sauce and salt and pepper to taste. Brush or pour it over the top of the rolls. 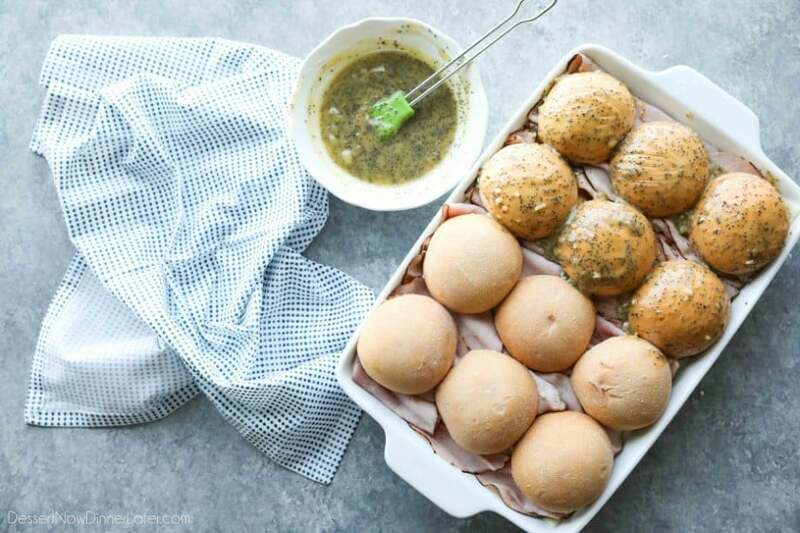 Cover with foil and bake at 350 degrees Fahrenheit for 25-30 minutes, removing the foil for the last 3-5 minutes, until cheese melts and everything is heated through. If using a metal pan, check doneness sooner. 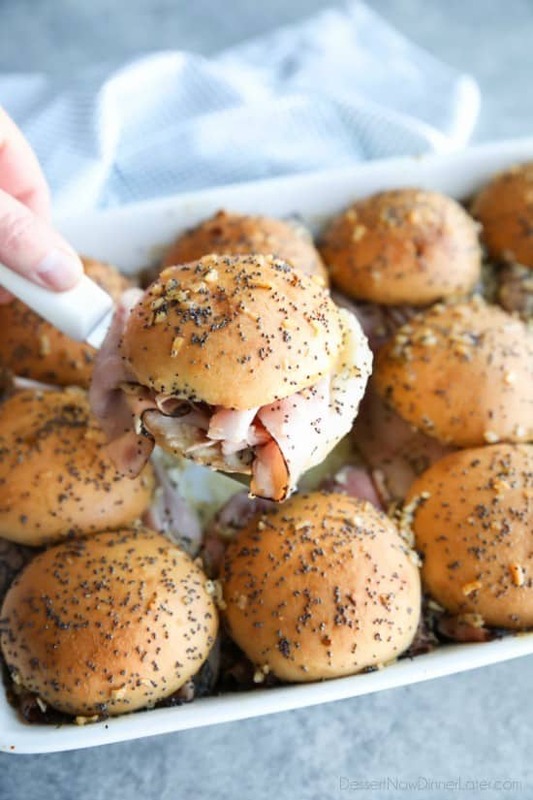 These ham and cheese sliders are finger licking good! 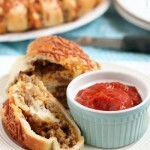 That sauce really permeates the whole sandwich and makes it so tasty. 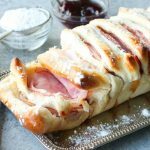 If you make ham for Christmas, this would be a great option to use up those leftovers. 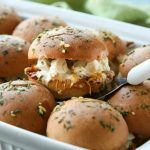 These would also be a tasty appetizer for New Year’s Eve or as a game day snack. Really, just be sure to make these! Use a serrated knife to slice the rolls in half. Place the bottom halves in a greased 9×13-inch pan. Spread a layer of mayonnaise/miracle whip on top of the rolls. 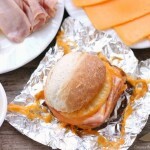 Then layer one slice of cheese, and a few slices of ham on each roll. Add the top halves of the rolls. Whisk together the melted butter, honey, dijon/yellow mustard, poppy seeds, dried onion, Worcestershire sauce, and season to taste with salt and pepper. Brush or pour mixture over the top of the rolls. 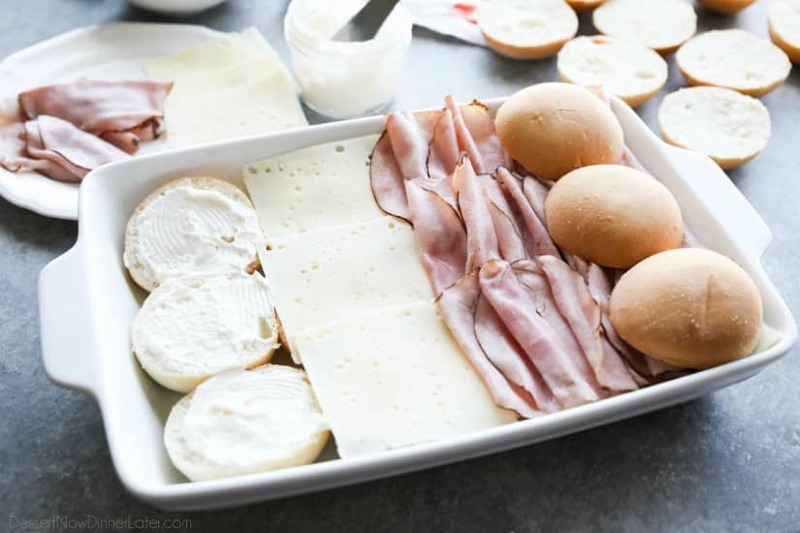 Cover with foil and bake at 350 degrees Fahrenheit for 25-30 minutes, removing the foil for the last 3-5 minutes, until the cheese melts and everything is heated through. If using a metal or thinner-type pan, check doneness around 15-20 minutes. Serve immediately. So delicious!!! Made these tonight with my oldest and it was a simple yet complex on the flavors dish!! I can see why Mr. P would want this more than just one in a while 😉 Added some Cavendar’s seasoning to the butter mixture and it was perfect! But then again, I’m a huge can of anything that has Cavendar’s on it. She got a kitchen set off her very own cooking utensils and asked if she could help tonight. I’m excited to add this to our rotation. I haven’t heard of Cavendar’s seasoning. I’ll look for it!